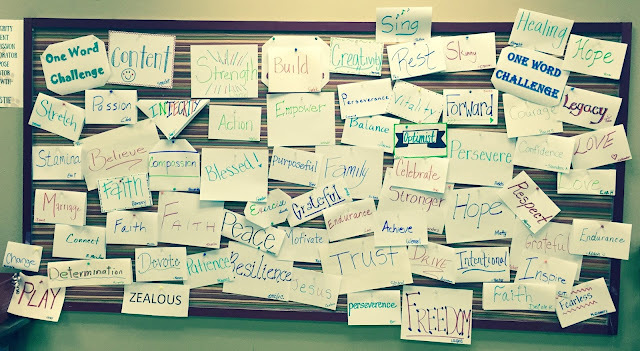 Many educators began the year thinking of one word that would best describe their hopes and dreams for 2016. 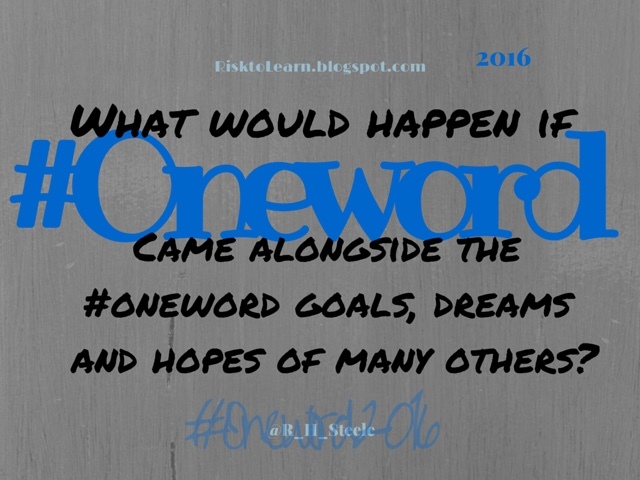 This #oneword or #oneword2016 movement brought many ideas and dreams together. Yet, while one word is powerful, what would happen if many #oneword representations came together? What would happen if ideas were shared, support and accountability was offered, and honesty as well as transparency was created? Believe. This is the word I chose to represent 2016 for me. I am a planner. I love to think ahead, think globally, and see the big picture. Yet, I move quickly and have a tendency to wish changes could occur at a much faster pace than the reality I usually find myself in is capable of. Planning while pacing are two key ingredients to success that must work together. I have found time and time again that life happens when I am busy making plans. In education, when there are minds and futures on the line, we can’t afford to let this become the norm. In essence, I must believe. I must believe in the collaboratively designed plan for student success. I must believe in the campus leaders, teachers, students, and families. I must believe in the process, believe in the work we are doing, and believe that success will come as a team, not individually. Imagine however, what would happen if each person I work with each day knew my one word goal, and I knew theirs? What would happen if every teacher, every person on one campus was open and willing to share their personal goal for 2016...would it bring us together? Would it provide a voice for every person? A shared accountability? A vision of an amazing year to come? This year I challenged my campus to join me in sharing their personal #oneword challenge. The idea was simple really...Write it down, post it, and let’s see what happens. As I write these words I am sitting alone in our staff lounge, staring at the bulletin board in front of me. I am taking my time as I look at each word, carefully. 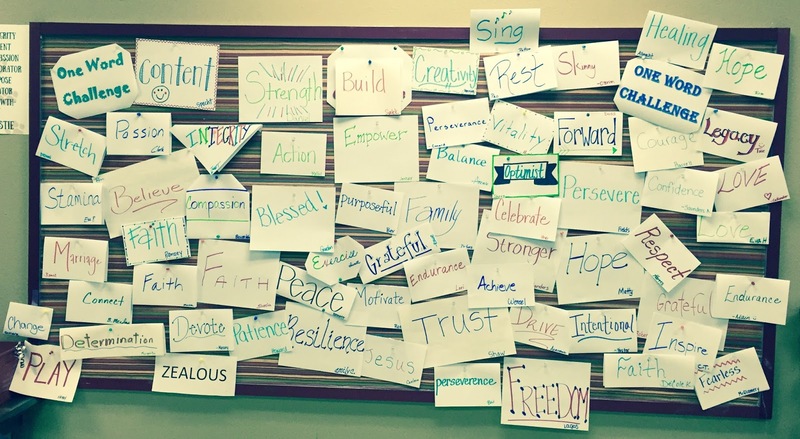 It’s amazing the words that jump off the board - all encompassing words like Trust, Patience, Respect and Integrity...repetitive words shared by others like Perseverance, Faith, Love, and Hope...Plus many more...words that represent personal goals, God, joy and change. While each word represents a different challenge, a new meaning, or a personal goal, I can’t help but notice how well everything seems to go together. Just as each person brings a different and wonderful uniqueness to our team, so does each of these words to the board in front of me. I can’t help but imagine what this place could feel like each day if each person were to live out…truly embrace...the one word he or she selected. What would happen if people lived lives of integrity each day? Strived to trust others? Showed love even when it isn’t easy? What would happen if peace, love and respect were norms? Inspiration and healing was everywhere? What would happen if we were grateful for the little things and were patient when things got hard? What would happen if we were completely devoted to each other and our students? What would happen if we found strength in the hard times, and a grateful heart after each successful moment? What would happen…. As I get ready to turn away from the words in front of me, I remind myself to remember this moment. Remember this day. Remember the words that carry so much meaning. I look to the left hand side, and there is my word...believe. I must believe in the heart of each person who took a risk and wrote down a word. I must believe that together, as a staff - dare I say family - anything is possible. All it takes is one word, one day at a time, together. Here is to 2016. A year I hope is nothing short of...well, the words written down by the most wonderful, dedicated, and amazing people I know. My word for 2016 is 'Determined' and it definitely aligns with 'Believe'. The sharing and combining does indeed represent the diversity and thus the potential of cooperation. Great post! Great "One Word Challenge"! It's a great reminder every day when I go into the lounge. I agree... very inspirational and a reminder of a specific goal and task. I also like the way everyone wrote their word... matching their personality almost!